This, I believe, is a major shift in our cultural construction of how power is controlled, even determined. In fact, this bit of news can be seen as a last breath of the old hegemony that has nearly driven us to the point of complete destruction. The jobs typically held by women–education and health care–are the fabric of society; everything else –finance, construction, high-tech, etc–is crumbling. The old guard is indeed falling apart, but the fabric of society, patched together by women, is holding. And with the Obama stimulus package, even increasing its strength. According to Peter Sloterdijk, the renowned German philosopher and a professor of philosophy and media theory at the Karlsruhe School of Design, there have been 3 phases of globalization: (1) the metaphysical globalization of Greek cosmology; (2) the nautical globalization of the 15th Century that creates global provincialism; and, finally, (3), the overcoming of distance. It is this last phase–our age–that is extremely interesting from the perspective of a new world order and the emergence of women in powerful positions. For the past 10 to 15 years, women from traditionally male-dominant cultures have found their way to Western colleges and universities. It’s an amazing ratio. Women from the East, especially China and Korea, accompany women from South Asia–India and Afghanistan , for instance–and mingle with women from Africa and the Middle East and Latin America. These young women, to use Homi Bhabha’s term, choose to be “unhomed” in order to advance. This, for them, is where “presencing begins because it captures something of the estranging sense of relocation of the home and the world–the unhomliness–that is the condition of extra–territorial and cross-cultural initiations”, says Bhabha. It is a form of exile apprehended so as to better themselves. In this condition, women are shifting, apparently always in movement, and challening deeply held beliefs about what has been accepted–to a fault–as the location of women in culture. Women are re-articulating boundaries. They are redefining material reality. This re-articulation of boundaries increases the potential for the feminization of cultures. The current generation of women in our colleges and universities and heading into the (traditional) world is searhing for interconnectedness, though they suffer a sense of estrangement in doing so. These are the women of the Third Wave of Feminism: the overcoming of boundaries, I call it, which is consistent with the movement’s history. Following Bhabha, women are inhabiting a space “narrower than the human horizon” that provides an “ethical entitlement to, and an enactment of, the sense of community.” This is something new, different. Michelle Obama’s planting of a White House garden, which follows Elenor Roosevelt’s garden historically speaking, is a case in point. The First Lady’s garden implies the need for a healthier nation, one that grows foods locally and that eats healthier–challenges to health care, the food industry, and the psychology of dependency of American citizens. Moreover, Michelle Obama is a new model. Gracious, elegant, classy and beautiful, she is also in shape, as our obsession with her arms shows. Mrs. Obama is the Third Wave of Feminism, as opposed to Hilary Clinton who represents the Second Wave. The difference is fundamental: the professional women of Mrs. Obama’s generation did not give up men or family; they pursued careers, but also kept the hearth moving. This Third Wave comes with an “ethical entitlement to, and an enactment of, the sense of community.” Women are demanding very different things of the social structures and the institutions that support them. Women are negotiating languages used in the past to (pre) define notions of reality–and truth. Nationhood, we can see by how women are stretching themselves across boundaries, is a morally arbitrary notion, a necessity of the post-colonial state, for instance. Rather, women are more concerned with an “insufficiency of self” and the needs of new urban communities of interest. Women fully understand the precarious sense of survival we are living today since this has been women’s historical position. They are best qualified to guide us through. Women are therefore the agents of change we need. Women working through their identities, as these come into conflict with ancient–and broken–models, discover their agency and, in turn, transform formally oppressive ways of thinking and being. It is a slow process, historically, but we are on a path we cannot now change. What in the past has been perceived as less valuable and thus exploitable, disposable and forgettable in the global political economy, now is no longer. Opportunities are shifting. We may be in fact witnessing the emergence of the Fourth Wave of Feminism–matriarchal societies. The cover cartoon by Barry Blitt shows the Obamas in the Oval Office. 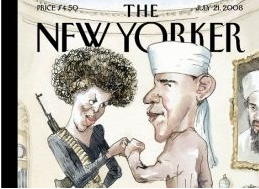 Michelle, sporting a radical chic Afro and an AK-47 over her shoulder—“Nothing gets between me and my AK”—stares intently at her husband, head tilted towards him, her left hand on her hip in an ah ha, you go girl pose. Her right hand reaches out to her husband’s, fist closed. Right on, we did it. Barack is in Muslim garb. A sly eye gazes at us—a fox, telling us to wait and see what’s next now that the Obamas have arrived. The other eye is presumably on Michelle. He reciprocates Michelle’s clenched fist. Right on. Two distinct artifacts behind Barack Obama adorn the Oval Office and flirt with our xenophobia and racism. An American flag burns in the fireplace and above the mantel looms half of a portrait of what can only be described as an Islamic fundamentalist, perhaps even Osama Ben Laden. Do we really need this now? Yes, we do. Michelle Obama’s Afro is 1960’s chic radicalism. 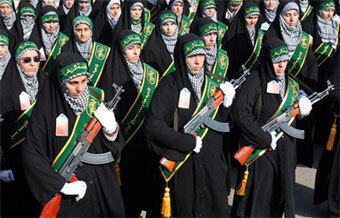 The AK-47 comes from the Middle East. In Tehran a billboard of a young woman and her AK-47 stares down at the busy streets reminding everyone that even the women of a repressive regime are willing to fight for the cause of Islam. Michelle’s cartoon figure fuses the strong African American female with the equally strong Middle Eastern woman, suggesting that a third, more dangerous possibility can reside in the White House—the woman that has appropriated our worst fears and is going to have her way. Cartoons are exaggerated messages. Realistically, Michelle embodies the post civil rights American Dream. She is the daughter of a city water plant employee and a secretary. She attended Princeton and Harvard Law, reaping the rewards of the civil rights struggle. The image is then not about Michele Obama at all. The cartoon overstresses how our deepest, most profoundly xenophobic fears can be manipulated to create a myth—even if the myth is a condemnation of the truth. The cunning Obama image confuses us, too. He has not helped himself in this respect, changing positions he once held, having to defend himself on issues ranging from his personal relationship with God and the flag to the wars to political reform. He’s backed by real estate professionals, medical professionals, commercial bankers and hedge fund and private equity managers. Obama’s ambitions are supported the old-fashioned way, money, and lots of it. He’s mainstream politics, with every sound bite moving more to the center. The cartoon is sarcasm all right, but it derides the viewer. It postulates knowledge, but not of the Obamas. It’s about us and how reliant we are on the media’s fixation with the surface of things. This was evident during the primaries when we wondered about Barack’s odd name, his relationship to Reverend Jeremiah Wright and his not sporting an American flag pin on his lapel. If Obama is not loyal to American iconography, the argument goes, then he must be loyal to something else, and with a name like Barack Obama, well then, it must mean he’s secretly loyal to Islam. He even wants a dialog with Syria and Iran—that says it all. Israelis have picked up on Barack’s middle name, Hussein, and read it as a sign of mistrust and contention. The New Yorker cartoon is our shortsightedness. It portrays, as Jonathan Ralston Saul has written, an “unconscious civilization,” a “civilization that scorns knowledge itself.” We aggregate the quick and easy, the first idea or, better, the first image until we can’t tell truth from fiction. We don’t know when we are being told something meaningful or when we are being made fun of—and in this case, both are true. In The New Yorker cover we find the Other we don’t want to face. This Other is not the fear that Islam or any other belief system may find its way into the White House, but rather, it is the sins of America that we have yet to resolve to enable us to move closer to reconciliation since, after all, what is demanded of us today is to find roads to end conflicts and renew friendly relationships with those we have scorned and violated. Our age requires deliberation, cooperation and collaboration, particularly when we find deep differences. The woman on Ferry Beach finally said to me, “I don’t know what this means, not now.” This is why we need to look at this cartoon. It’s an image not of the Obamas, it tells us nothing about them, but of our challenges and conflicts, of us, the citizenry that has been sleeping away the promises of America. Yes, we need this now—because we are inalienably free and we’ve yet to realize the promise of this truth.